Heading to Thailand? Follow these tips to make the most of this dream destination, and avoid these common health misadventures that befall tourists. I’m Camille, from the French travel blog L’Oiseau Rose. I’ve travelled the world for several years now, and Thailand is one of my favourite countries. In between working as an intern and vacationing, I’ve spent a total of six months in this magnificent country. Today, I’m sharing my Thai experience to warn you of the main dangers tourists encounter in Thailand, especially in the islands. Almost everyone rents scooters in Thailand. They’re practical, cheap, and the sense of freedom you get from their little engines is pretty great too. This said, scooters are dangerous! Remember to mind the rules of the road: always wear a helmet, control your speed, and don’t drink and drive. Many tourists in Thailand disregard these three essential rules, and accidents ensue. 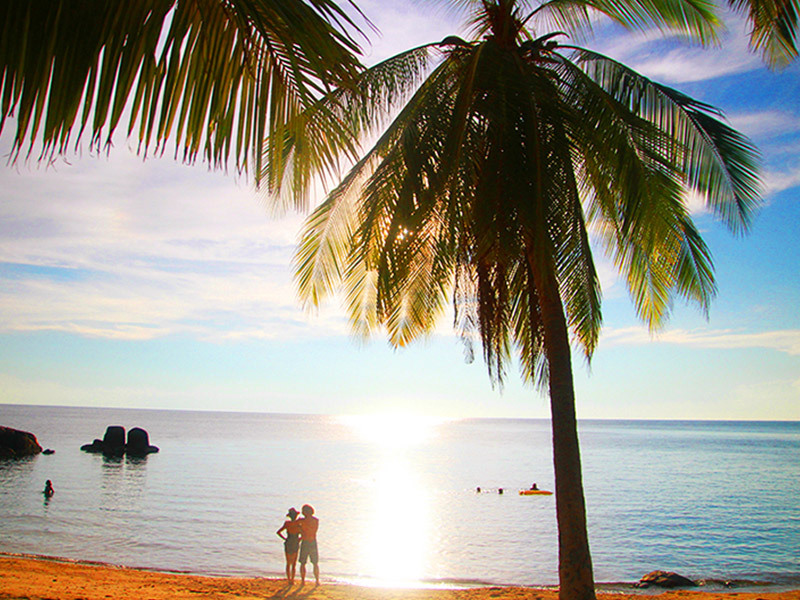 The island of Koh Phangan is a perfect example of how accidents can happen in paradise. Known for its outrageous parties (like the Full Moon Party), this island attracts millions of young tourists in search of unforgettable experiences every year. For some, however, the dream turns into a nightmare when an accident occurs. My advice to you: always wear your helmet (even in the Thai heat) and never drive your scooter back to your hotel if you’ve been drinking. Before your trip, make sure you get good travel insurance too; it will cover a potentially humongous cost in the event of any mishaps. Know in advance, however, that if your injury or sickness is a direct result of intoxication, most travel insurance providers won’t cover your claim. Many bars along Thai beaches offer nightly fire shows. They’re a captivating spectacle and create a festive ambience. It may look easy, but like all true professionals, these fire jugglers train regularly! You’ll never be as good as a professional Thai fire thrower, so don’t even try to imitate them. Many fire shows ask for audience participation. Some even offer prizes if tourists agree to jump through a flaming hoop or jump over a flaming rope. Sadly, it’s not as easy as it looks to keep your balance; every night, many participants end up with burns. I bet that most haven’t even thought of insuring themselves adequately before their trip! Accidents can happen fast. Whether you’re travelling covered or not, I recommend you avoid flame throwing altogether; you’ll definitely regret it if you end up with a burn on your trip. Want to snorkel? Most Thai islands are perfect destinations for both! Make sure to heed safety precautions if you’re exploring sea life. While I was on Koh Tao, I saw a lot of tourists injured by coral. They might seem like small scrapes and cuts at first, but nicks and scratches can quickly become infected if not adequately treated. This is why I always suggest getting travel insurance before you leave home. Treatment can be costly; those travelling on a budget might actually avoid going to the doctor, even when it’s necessary. This is one less choice you need to make if you have travel medical insurance: a trip to the clinic or the hospital is covered. There’s less chance a small cut will become infected if you avoid unnecessary complications, which always cost more than you think! The heat and humidity of Thailand’s tropical climate makes it difficult for cuts to heal. It’s extremely important to carefully disinfect any wound, big or small. Also, never go snorkelling alone; even in areas where the current is small, you could get a cramp or suddenly feel faint and weak. It goes without saying that it’s beyond hot on Thai islands! It’s especially hot if you’re visiting between December and April. Always protect yourself from the sun. Wear sunblock if you’re going to the beach, but also if you’re walking around town. If you have to travel long distances in full sun, I highly recommend wearing a hat and drinking a lot of water. Many tourists fall victim to heatstroke in Thailand. With heat stroke or sun stroke, your body is unable to regulate its temperature; you get a headache, become red in the face, and may even feel nauseated. If you experience any of these symptoms, stop all physical activity, seek shade immediately, and hydrate abundantly. Heat or sunstroke generally doesn’t appear without warning signs, so learn how to listen to your body, and don’t take them lightly. Heat and sun stroke can provoke neurological damage, or affect the heart or kidneys. Heat and sun stroke are covered by travel insurance, but it’s better to avoid them altogether rather than end up in a clinic or hospital. So, even if you are well insured, be safe in the sun! No one wants to waste precious vacation time because of too much sun. 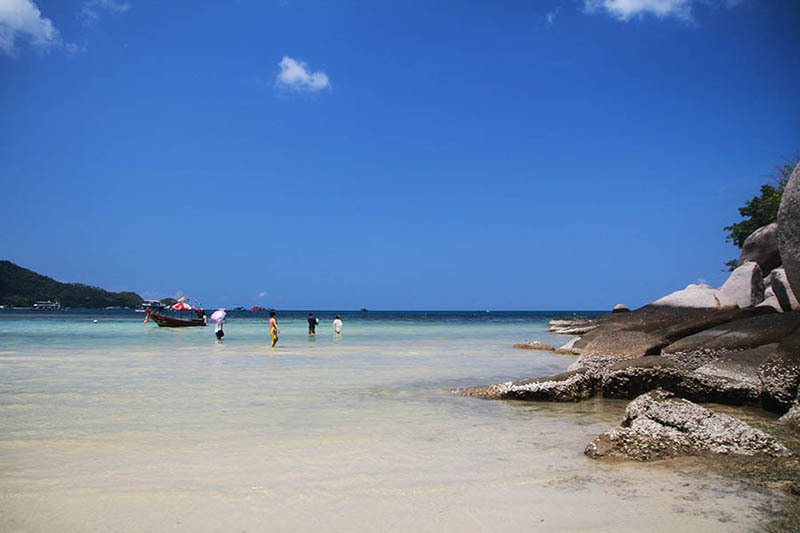 With these tips in mind, enjoy Thailand’s islands to their fullest! Before you go, contact your local insurance broker and ask for travel insurance from TuGo. Absolument ! insolation et les puces des sables boutons roses sur le corps mais sans gravité.